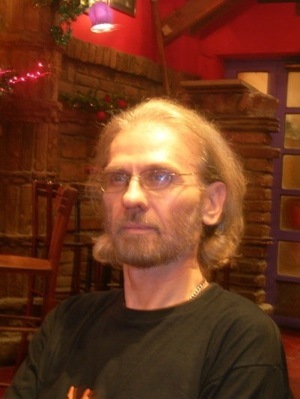 Dean Rašković lives and works in Belgrade. Occupation: a doctor, specialist in veterinary medicine, an editor of the specialized magazine Veterinary informator, a yoga and meditation teacher, pranotherapist, writer, poet and journalist. Doc Dean Rašković started practicing yoga in 1972 at Jasmina Puljo. After that, he practiced yoga at different instructors until he met Jovanka Kavaja in 1980, whom he considers to be the greatest yoga teacher in this area and the one he learnt the most from. During the eighties he got the initialization from Swami Satyananda Saraswati, the Bihar school. On his spiritual journey he dealt with esotery, theosophy and Tibetan Buddhism. While he was searching for specialization he met many teachers and he practiced with them. The biggest impressions on him made: Holy Dalai Lama, Karmapa, Lama Norbu Rinpoche, Lama Tenzin Rimpoche,Lama Chopel, Lama Nawang, Lama Ole Nydahl, Father Calisto and others. He spent a year in one of tibetan monasteries which influenced his developement. He meditated fiftheen hours a day on average and that helped him to experience higher levels of conscious. The chief of that monastery offered him to stay three months, three weeks and three days in isolation but he couldn’t accept it since he had his own private veterinary ambulance for little animals. Realizing the seriousness of the situation and his potentials, Lama transferred him secret knowledge which enabled his fast improvement and his own transfer of knowledge and states to others. He had one of the deepest experiences when he was in retreat. He stayed for six days and six nights in a room of four square meters which was so strangely arranged that he didn’t know whether it was day or night. He has been working as a yoga and meditation teacher for 24 years. In the beginning he held group lessons but soon he gave up because he wasn’t able to see all the students and therefore he couldn’t correct them and teach them to do the exercises properly. Now, he exclusively holds individual lessons that count maximum three students. He divided groups into six levels: Beginning 1 and 2, Intermediate 1 and 2, and Advanced course 1 and 2. Even within those groups, he selects students who are similar on the physical, mental and energetic levels so that the class can be more successful. The thing that is specific for his classes, which I consider to be complicated and difficult, is that each class is totally different and it depends on students’ state. His classes demand not only the flexibility but the strength and physical condition of the practitioners. Classes of this exquisite teacher are actually intensive courses and students’ progress is fast. He is a supporter of strong classes because more difficult exercises cause faster activation of energy. According to him, only the real teacher can awake the true samskara knowledge (subtle impressions) from your past lives, whether by touching or teaching (energy). Therefore, his students experience different sensations during and after the classes, such as the flow of energy through different parts of body, the feeling of levitation, bliss, and within them they hear different sounds: humming of waterfalls, sounds of bells and flute. They have the astral projection and the most important is that they become completely relaxed and they attain spiritual peace and harmony. Some need more time to come back from that state. Doc Rašković teaches his students self-control, how to transform negative emotions into positive, how to breathe properly, and the most important thing is to be aware of every moment, to be here and now. He insists on synchronization of body movements and breathing. He considers yoga to be a mind science and in practical sense kundalini yoga brings enlightenment. Due to many obligations, this teacher unfortunately cannot accept more students because he has very little spare time and only the students, who are karmically connected with him, attend his classes.